The AutoMac Loading System was developed by Colmac Industries as a complete automatic loading system in three operator loading area sizes. It utilizes a spiral conveyor that becomes a loading rail to assist in hangering garments, a storage system to hold garments, and a supply conveyor that transfers the hangered garments to the AutoMac Loader Head. 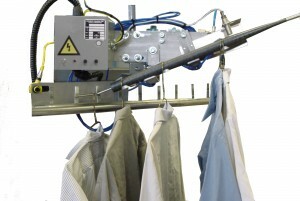 Unique, simple hanger separating system requires little maintenance, no adjustment, and allows different hangers to be processed simultaneously. The design virtually eliminates the problem of double loading onto the tunnel finisher conveyor resulting in better quality from the finisher. As long as there are garments being supplied to the loading system, all the spaces on the tunnel finisher conveyor will be filled by the AutoMac providing for a more productive tunnel finisher. Loading control sensor system instantly compensates for change in conveyor speed.